Several years ago, I graduated from college and found myself in a small town in the Adirondacks. I tried dragging some non-hiker friends up a few peaks, so I wouldn’t have to go alone, until a coworker suggested joining ADK. He said that chapters offer year-round volunteer-led outings all over New York State, and even sometimes into surrounding states. Activities like hiking, backpacking, paddling, cycling, cross-country skiing, and snowshoeing were common on the calendar, so I decided to join and try it. I was nervous signing up for that first outing. I didn’t know anyone, and we were going somewhere I’d never been… in winter. What would the pace be like? Am I in shape enough for this? Do I have the right gear? Will I look silly and unprepared? What if I don’t like the other participants, or what if they don’t like me? Only one way to find out! Looking back at photos, perhaps I did look silly and unprepared. I didn’t even own any waterproof attire at that time. Despite my anxiety, no one put me down, and I never felt judged or excluded. Instead, I was welcomed by a group of people who expressed genuine interest in getting to know me and helping me grow. I met men and women of all ages and experience levels, each with their own interesting backgrounds and skill sets, eager to share their knowledge with others. ADK leaders and members provided endless encouragement and opportunities to learn and ask questions, until eventually I felt comfortable leading trips of my own. Every outing is an adventure, and I’ve met all my best friends through the club. Adirondack Mountain Club is a nonprofit organization focused on the conservation, preservation, and responsible recreational use of the New York State Forest Preserve and other parks, wild lands and waters. Mission-based programs include promoting land stewardship and working for access to recreational opportunities, maintaining trails, advocating for wilderness protection, providing outdoor skills and education and protecting New York’s alpine ecosystem. ADK is made up of 27 chapters across New York, and each provides a warm, welcoming community for the geographic region it serves. The Capital District area includes the Albany, Schenectady, and Glens Falls-Saratoga chapters, who all offer opportunities to recreate, socialize, learn, and to give back through trail work and volunteerism. You can whitewater paddle with Schenectady, or enjoy free monthly presentations and educational sessions with the Albany and Glens Falls-Saratoga chapters. If you like collecting patches, the Schenectady chapter offers one for completing the Northville-Placid Trail, and Glens Falls-Saratoga offers one for the Fire Tower Challenge. Young adults and families can connect with peers through “Young Member” outings, aimed at those in their 20s to 40s. 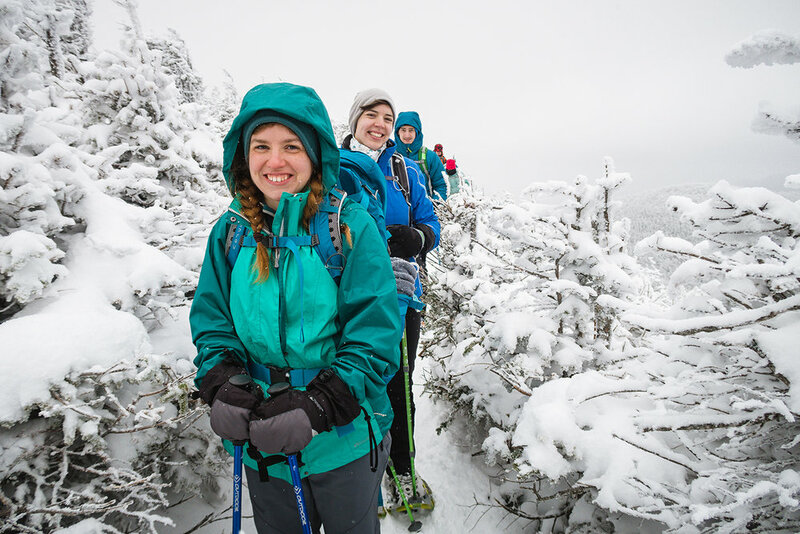 There’s even a big young members’ weekend happening at ADK’s John’s Brook Lodge on Saturday-Monday, June 24-26, with opportunities to hike in the High Peaks! Perhaps you’re more into cycling? On Sunday, July 30, “Ididaride!” bike tour riders will take in the gorgeous Adirondack views along a 75-mile loop from North Creek to Speculator to Indian Lake, ending back at the North Creek Ski Bowl Park. If 75 miles sounds like a lot to you, don’t worry, there’s a 20-mile option as well! In addition to recreation, ADK keeps members updated on what’s happening with conservation issues, and makes it easy for you to become an advocate for protecting state land and minimizing the impact of invasive species. If you like getting out of the house, you can volunteer as a citizen scientist, summit steward, campground host, or naturalist, with training available so you’ll feel comfortable and confident. Like using your muscles to make a difference? There’s a long list of trail projects for both teens and all ages happening all summer long. ADK’s National Trails Day event is Saturday, June 3 at the Adirondak Loj in Lake Placid, offering 10 different trail projects to choose from. If you’re new to doing trail work, this is the perfect opportunity to see what it’s all about. As an ADK member, you’ll not only have opportunities to explore New York and meet new people, you’ll also receive a host of other benefits! Who doesn’t love a discount? Members get 20% off ADK’s maps, guidebooks, calendars, and other publications, and receive a subscription to Adirondac magazine, as well as 10% off any ADK logo merchandise. ADK’s Heart Lake Program Center offers guided hikes, skills workshops, and educational programs at 10% off. Whether you’re looking for an intro course or building upon your current skill set, there’s something for everyone. The Adirondak Loj, Johns Brook Lodge, and the Wilderness Campground at Heart Lake are excellent base camps for your year-round trips to the mountains, and members receive 10% off all lodging, too. Stephanie Graudons (stephanie@adk.org) of Mayfield is ADK’s Young Member Outreach Coordinator. She is an Adirondack Winter 46er, NYS Licensed Hiking Guide and adventure photographer. Follow at greatrangeframes.com. The Appalachian Mountain Club is a large national club with chapters across the eastern U.S. from the Maine Woods, Berkshires, Catskills. and down to the Shenandoah Valley. The club’s mission promotes outdoor activities, such as hiking, paddling, cycling, climbing, plus offers discounts on lodging and camping and offers skills and leadership, conservation and youth programs. While AMC has 12 main chapters, within our reach we have the Mohawk Hudson chapter, formed in 1998, making it the youngest chapter in the club. It has over 700 members located in the 11 county region of eastern New York State comprising of Albany, Columbia, Fulton, Greene, Montgomery, Rensselaer, Saratoga, Schenectady, Schoharie, Warren and Washington counties. The Taconic Hiking Club is locally based and sponsors outings throughout the Capital Region and beyond, with an emphasis on the Taconic Crest Trail. The club’s primary responsibility is to maintain the 37-mile long Taconic Crest Trail, working with NYS DEC and Massachusetts’ Department of Recreation and Forests. The club is the sole agency able to patrol and maintain the entire length of the trail and report conditions to other agencies. Relatively new on the scene is the Catskill Mountain Club, founded in 2004, it is an all-volunteer grassroots organization of outdoor enthusiasts dedicated to providing a wide range of non-motorized outdoor group activities throughout the Catskill Park and the larger Catskill Mountain region, including hiking, camping, cycling, snowshoeing, kayaking and canoeing.